Cat’s can’t speak or communicate in the same way humans do, but they still try to get messages across to us in their own way. 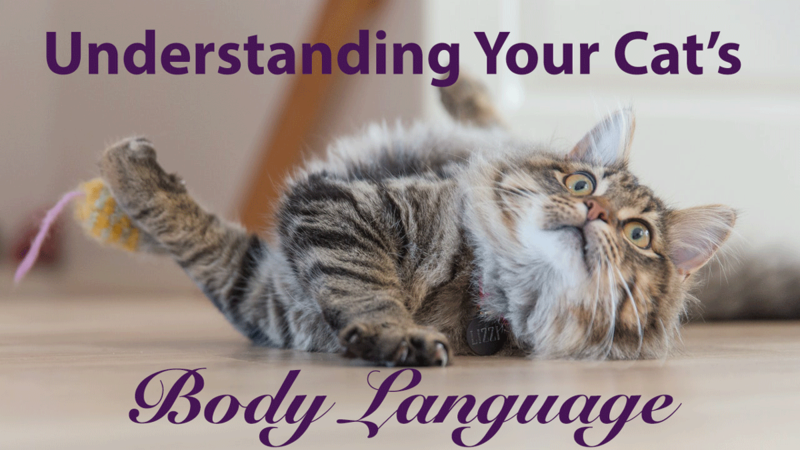 Nuances in their body language can express agitation, happiness, sickness or fear, and it’s important for you to be able to read these signals in order to provide reassurance, take them to the vet, or changes something about their environment. The many sounds cats make can be quite delightful and adorable at times. Interestingly, most of the sounds cats make are specifically to communicate with humans; cats in feral colonies are much quieter than domesticated cats. 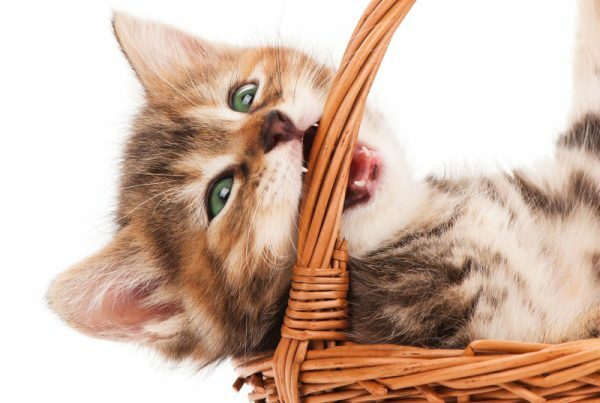 Each cats finds the best way to communicate with its owner to express comfort, agitation, fear or desire for food or play. Cats exposing their underbellies is a sign of trust or invitation to play, not necessarily that they want you to actually stroke their belly (I know, such conflicting information!). Although cat tails have a very important function for helping the cat maintain balance, it also plays an important role in body language. The default tail position for a cat is horizontal, while a vertical tail will signal confidence and may be used in excitement or while greeting a person or another cat. The first signs of a frustrated cat will be in a flicking tail which may escalate to thrashing in anger if the cat is further agitated. Many people mistaken this flicking/thrashing tail as a sign of excitement, when it’s actually a signal of predatory behavior (towards a small animal) or to back off (a human or another cat). 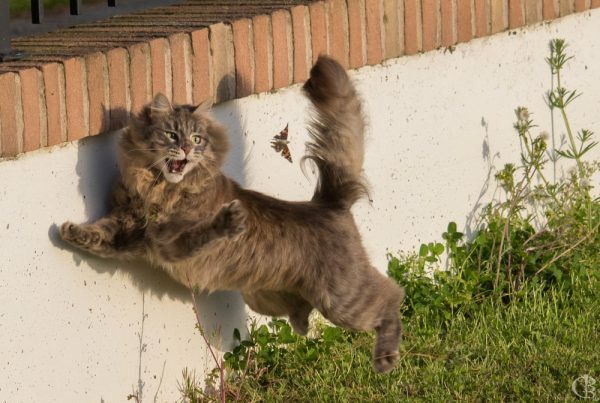 A startled or aggressive cat will have their tail hairs stand on end to try to look bigger and more intimidating to a foe, and a fearful cat will have their tail tucked away or pointed down. As one of the post distinguishing aspects of a cat, the purr can indicate a wide spectrum of emotions. 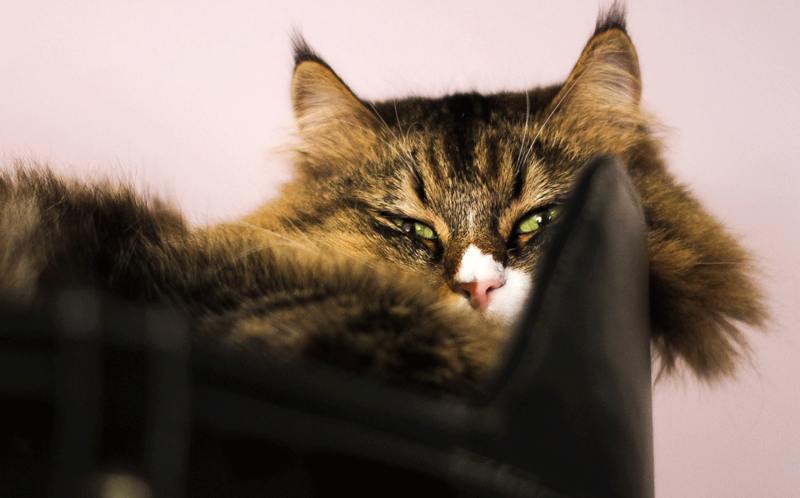 Cats will purr when they’re happy and content or when they’re distressed and in pain. It can be baffling to get the same purr response from your kitty when they’re curled up in your lap as when they’re stressed out at the vet, but it seems that the purr is multi-purpose. Some think that it has a self-soothing or even healing effect. Cats also use purring as a form of communication or in anticipation for something they desire, such as a treat. This purr is usually lower, harsher and more urgent, and is referred to as a solicitation purr. Direct eye contact signals aggression and eye aversion (looking away) shows non threat. Perhaps this is why cats seem to hang around the one person in the room who dislikes cats; they’re more likely to try to ignore and not make eye contact with the cat. Squinted, slow blinking means your cat is comfortable, signaling they don’t see you as a threat and therefore don’t need to have their gaze locked onto you. Eyes wide open is a sign of fear, alertness or stimulation. Because cats rely so heavily on their sense of hearing, they have the ability to swivel their ears around in all directions to help pick up noise. 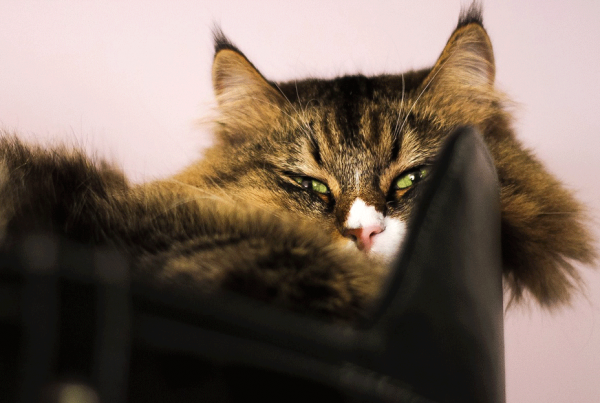 Relaxed, forward facing ears are a sign of comfort, while fast-twitching ears that erratically move about can be a sign of distress or that your cat is overwhelmed. 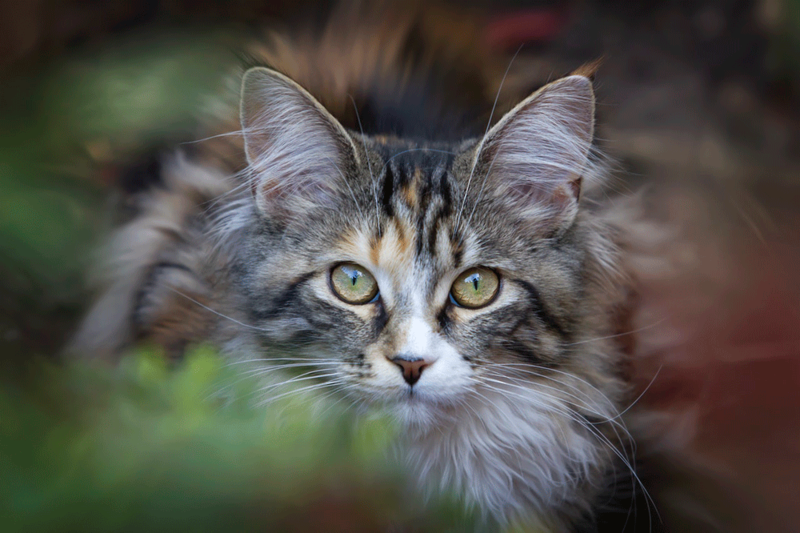 A fearful or aggressive cat may pin their ears back or fold them down to the sides; this is a strong sign to back off and let the cat calm down. If you’ve ever seen your cat in this pose, it’s probably from playfulness as opposed to fear and aggression, although this pose is naturally used by cats for either purpose depending on the situation. With their back arched, side facing you, hair standing straight up, and tail bushy and pointed down, a cat in this pose might hop around playfully trying to get you or other cats to join in. If a cat is using this pose out of fear or aggression, they’ll likely also be hissing and growling. Read more on the Halloween cat pose here. Referred to as “bunting”, this action is often mistaken as a sign of affection and desire to be pet, cats will rub against people or objects as a way to mark their territory. Cats have many scent glands in their face, and rubbing against things leaves their scent behind. Serving no other purpose than to express comfort and contentment, cats will often knead around a special person or cat in their life. Perhaps you’ve seen a cat give you the “stinky face”, aka mouth open, lips curled back and eyes squinted after smelling something. While it seems like they’re obviously revolted by the thing they just smelled, this is actually a purposeful response that intensifies the odor to give the cat more information. This is all thanks to an organ called Jacobson’s organ, which cats have on the roof of their mouths and increases the intensity of scents. The number of ways cats express their desires and emotions is truly endless. For a more detailed dictionary on feline body language visit here.